4. It’s Time to Begin! In Forex trading we trade in pairs. There is a constant struggle between the two currencies that make up the pair. If we take the EUR/USD, for example: When the euro gets stronger, it comes at the expense of the dollar (which weakens). Reminder: If you think that a certain currency will get stronger against another currency (“go long”, or “go bullish” in the Forex jargon) you should buy it. If you think a currency will get weaker (“go short”, “go bearish”) sell. The Majors (Major currency pairs): The A-List of currencies. The Majors are a group of the 8 most traded currency pairs. These are the most powerful and popular pairs in the market. That means that trades on these pairs are much more liquid. Majors are traded in high volumes, which makes the trends more significant. Majors are influenced by the news and economic events worldwide on a daily basis. One of the reasons these currencies are the most traded and considered majors is that they are the currencies of developed and democratic nations, where all economic events are transparent and lacking manipulation by authorities. All majors have a common denominator – the U.S. Dollar, which appears in all of them as one of the two currencies. Most of the markets in the world hold U.S. dollars in their capital inventories, and many governments trade dollars. Did you know that the entire global oil market is traded with dollars? Tip: Our advice to beginners is to start trading the majors. Why? Trends are usually longer, the opportunities are endless, and the economic news covers them all the time! Example: Let’s look at the pair EUR/JPY. Say events with negative impact on the Yen are taking place in Japan these days (the Japanese government is planning to inject more than 20 trillion Yen to help the economy and increase inflation), and at the same time we have heard some mildly positive news for the Euro at a press conference of the ECB president Mario Draghi. We are talking about great conditions for trading this pair by selling JPY and buying EUR! When a certain instrument is gaining power (bullish) and you want to buy it (go long), you should search for a good partner – an instrument with weak momentum (one that looses power). Euro Crosses: Pairs that include the Euro as one of the currencies. Most popular currencies to go side by side with the euro are (apart from EUR/USD) JPY, GBP and CHF (Swiss Franc). Tip: The European indexes and the commodity markets are very influenced by the American market and vice versa. When the European stock indexes move up, so do the US stock indices. For Forex, it is quite the opposite. The USD goes down when the Euro goes up and vice versa when USD goes up. Yen Crosses: Pairs that include the JPY. The most popular pair in this group is EUR/JPY. Changes in USD/JPY or EUR/JPY almost automatically cause changes in other JPY pairs. Having new options to trade. Pairs of these groups create new trading alternatives. Following their status will help us make trading decisions on the majors. Not clear yet? Let’s elaborate: Say we want to trade a pair which includes USD. How do we choose a partner for the USD? Assume we are having a difficult time deciding on which pair to trade – USD/CHF or USD/JPY. How to decide? We will examine the present status of the pair CHF/JPY! Makes sense, right? That way we can figure out which one of the two currencies is going up and which one is on its way down. In our example, we will stick with the one going down, because we mentioned that we are looking for a currency to sell in order to buy the rising dollar. The volume of activities within this group is very low. That is why you need to bear in mind that the transaction costs that the brokers charge on trades (also known as “the spread”) with these pairs are usually a bit higher than the costs being charged on the more popular pairs. Tip: We do not advise you to take your first steps in Forex by trading these pairs. They fit mainly experienced brokers, who operate on very long period trading sessions. Exotic traders are very familiar with these exotic economies, using market forces to follow fundamental systems which you will meet later on, in the fundamental lesson. The Forex market is global, open to action 24/5. Still, there are better and worse times to trade. There are times in which market rests, and times when the market rages like a fire. The best times to trade are when the market is packed with activity. At these times changes are bigger, trends are stronger, volatility is higher and more money is changing hands. We recommend trading in times of sizzling volume! There are four centers of market activity. They are introduced from east to west (chronologically trade starts east and ends west): Sydney (Australia), Tokyo (Japan), London (Great Britain) and New York (USA). The busiest trading hours are 8-12 am New York time (when two sessions are working simultaneously – London and N.Y..), and 3-4 am New York time (when Tokyo and London are simultaneously active). The busiest trading session is the London session (the European session). The Sydney session is more local and centralizes low activity. It is great if you live in this part of the world or are familiar with the socio-economic and political conditions in Oceania, but if you’re not, it is best avoided. Tokyo – The center of the Asian markets. The Tokyo session is an active one, approximately 20% of all global activity takes place at this time. The Yen (JPY) is the third most powerful currency (after the USD and EUR). 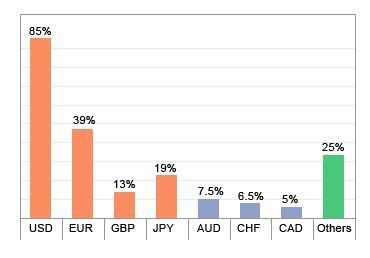 15-17% of all Forex transactions include JPY. Major forces in Asia are mainly the central banks and gigantic Asian commercial corporations, particularly the ever-growing Chinese financial sector and the Chinese traders. Popular currencies in the Tokyo session are JPY of course, and AUD (Australian Dollar). The first economic news to be released during the day comes from Asia. That’s why opening hours usually encourage strong activity and set the tone for the following sessions. Impacts on the Tokyo session can come from N.Y.. closing (the session before), major news coming from the Chinese market and events happening in neighboring Oceania. The Tokyo session starts at 7 pm N.Y.T. London – The center of the European financial market in particular, as well as the global market in general. Above 30% of all daily forex, transactions take place in London’s session. Due to its high volume, London offers many options and opportunities, but also higher risks. Liquidity is high and markets can be volatile which offer great winning potential if you know how to trade properly. Trends in this session can look like a roller coaster. News and events from all over the world feed into this session. Many trends which begin in London session, keep their momentum in the following N.Y. session by moving further in the same direction. We recommend entering this session with positions on the majors, and not on exotic pairs or currency crosses. Commissions being charged on the majors during this session are the lowest. The London session opens its doors at 3 am N.Y.T. New York – A very significant session, due to its wide range of activity and because it is the center of trade for the USD. At least 84% of global Forex trading include USD as one of the traded instruments that make up the currency pairs. The published daily news is extremely important, influencing all four sessions. This factor, together with the parallel European session in morning hours, make these hours (till lunch break New York time) the busiest hours in this session. Starting noontime this session weakens and on Friday afternoon it goes to sleep for the weekend. There are times in which we can still catch a lively trade because sometimes trends change direction just before closure. Remember: The busiest trading hours are when two sessions are simultaneously active, especially the intersection hours of London + N.Y. (London’s closing hours are usually very volatile and characterized by powerful trends). Tip: The best days to trade are Tuesday – Friday, at N.Y. early afternoon hours. Now you understand why Forex has become the most popular market in the world. You also understand how inviting and convenient it is, for all kinds of traders, at any hour, in any place, and with any amount of money. Forex offers massive earnings potential for traders of all types. While one trader relates to Forex as an opportunity to attempt to earn additional income; a second trader may look at Forex as a great long-term investment opportunity in order to make nice returns on his savings instead of letting them rest in the bank; a third trader might consider Forex a full-time profession, studying market analyses thoroughly so he can make big returns systematically; meanwhile a fourth trader, who is willing to take risks may look for ways leverage his positions to maximize his gains. On each and every day more than 5 trillion dollars are traded around the globe! Think about it – that means that more than 5 million traders worldwide can make 1 million dollars each! More than 80% of Forex transactions are executed by small and medium traders! Tip: If you are interested in further investment channels beyond the Forex market, the commodities market offers great opportunities. Examples of common objects are gold, silver, oil, and wheat (Prices of these goods rose dramatically over the past few years, in tens and even hundreds of percentages!). In essence, commodities trading is similar to Forex, and today, almost all popular brokers offer commodities trading as well as Forex. We’ll look at this topic in more detail later on in the course. In Chapter 4 – Get Equipped for Forex Trading we will go over the various necessary tools and Forex trading strategies needed to succeed as a Forex trader!